View More In Dust Collectors & Air Cleaners. 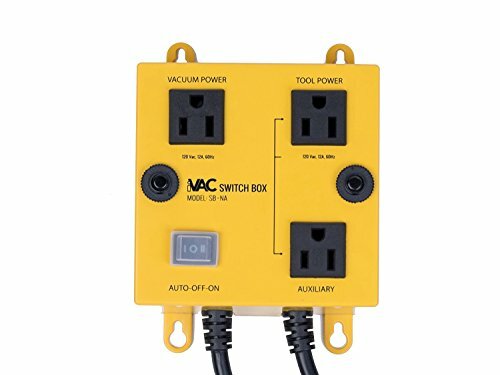 The Intelligent Vacuum Switch eliminates the distraction of turning on and off a dust collection system while you are operating potentially dangerous power tools. Received ETL safety approval. Three modes of operation: Auto, Off , On and Turn-On delay avoids the two power surges occurring at the same time Turn-Off delay clears work area of remaining debris after tool has stopped. Two input power cords permit operation from two separately protected circuits when the combined load from tool and vacuum exceed 15 Amps. Both power cords are individually protected with 15 Amp circuit breakers. Compact and lightweight, switch mounts to the wall. Designed to conveniently enhance your work shop safety. 2640 TOTAL WATTS two input power cords permit operation from two separately protected circuits. TURN ON DELAY avoids the two power surges occurring at the same time. TURN OFF DELAY ensures that your work area continues to be cleared of remaining airborne debris. Modes of operation: Auto, Off and On. Dust Collector / Shop Vacuum up to 1HP or 5 Peak HP. NO VENTING HOLES the iVac's internal components are designed to generate very little heat. If you have any questions about this product by iVAC, contact us by completing and submitting the form below. If you are looking for a specif part number, please include it with your message.